I had a big blog post planned out in my head about my recent birthday. It was a good one- I promise. But then, today happened. First, we had to take our car into the shop for the state inspection and an oil change. The mechanic’s have wi-fi so I figured I’d sit there for an hour, work and come out only about $50 poorer for my troubles. Yeah- not quite. On the way to the mechanic’s I rolled down all 4 windows and when I tried to roll them back up, only three made it- the 4th was stuck. So my quick and cheap visit to the mechanic ended up taking 2.5 hours and costing me almost $300. But, you know what? Things happen- what can you do? We didn’t have a choice but to fix the window and better it happen today when the garage had the parts. We were supposed to get rain tonight and I didn’t want to have to jury-rig some redneck window cover to tide us over, so fine- we can deal. Sure enough, this afternoon it started to rain on my way to get the kids from school. Then, very quickly, the rain turned into a wicked storm with huge thunder boomers, lightening, winds and torrential rains. I had drugged our dog, Crazy, before I left (she’s storm-phobic) and let her out to pee. I was going to be gone 30 minutes tops, so I figured she couldn’t get into too much trouble. 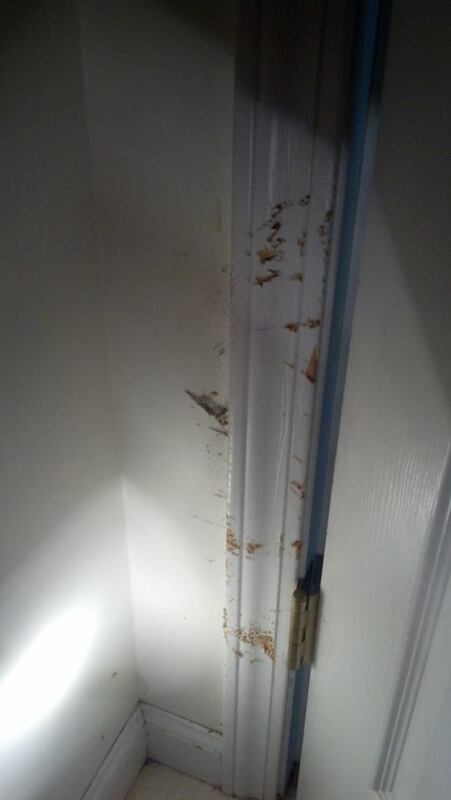 Those are scratch marks in my door jam and wall taken by light of the flashlight because we lost power. The poor dog had gotten herself stuck in the bathroom and completely lost her damn mind. It was something out of a horror flix. I had to close the door of our bathroom and clean up the entire mess in the hot, damp room by the light of the flashlight. Seriously people, I didn’t sign up for this when we got this mutt. But damn it, I’m an optimist. It could have been worst- all the damage is repairable. The vent and floors can be easily cleaned and at least it was limited to this one area of the house. Yes, I wanted to vomit now myself (but couldn’t because no power = no running water, so I couldn’t flush the toilet). Yes, I needed a full shower after stepping in unmentionable things (but couldn’t take one because of the no running water situation). Yes, it was hotter then hell inside our tiny, windowless bathroom and I was sweating like a pig while breathing through my mouth. But things could have been worse. 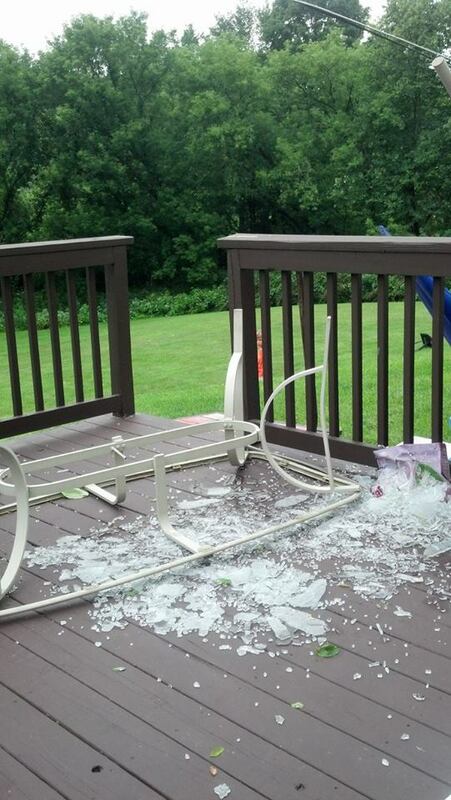 Yes, that is my patio table smashed to a million pieces. So- how was your Monday? **And no- we would never hurt our dog. We may fantasize about it on days like today, but if we haven’t sent her over the Rainbow Bridge yet, I think she’s safe from us.